The American Chemical Society revamps and extends a pilot program to support budding chemical entrepreneurs. Just a few years ago, Patrick Kearney found himself in a place that is painfully familiar to many chemists. When his position as a senior director of medicinal chemistry at a San Francisco Bay Area biotechnology company was eliminated in 2011, he entered a challenging job market feeling as though his career had stalled. Eager to find another career path, Kearney made a decision to pursue a longtime dream of starting his own contract research organization (CRO). He was acting on a promising business idea that had come to him during one of his job interviews. As he sought resources to help him take that leap of faith, Kearney learned about the American Chemical Society’s Entrepreneurial Initiative, a program to support ACS members who would like to pursue starting and operating their own businesses. At the time, it was a new two-year pilot program, and he wasted no time in applying to be a part of it. Read more. Judy's thoughts on obstacles for women in science were published in the C&EN article Women in Industry on August 26, 2013. Judy notes that women are too reserved in talking about their accomplishments and thus rarely gain the clout held by marketing and sales people. She also points out that women hesitate to speak up or take credit, in fear of seeming aggressive. 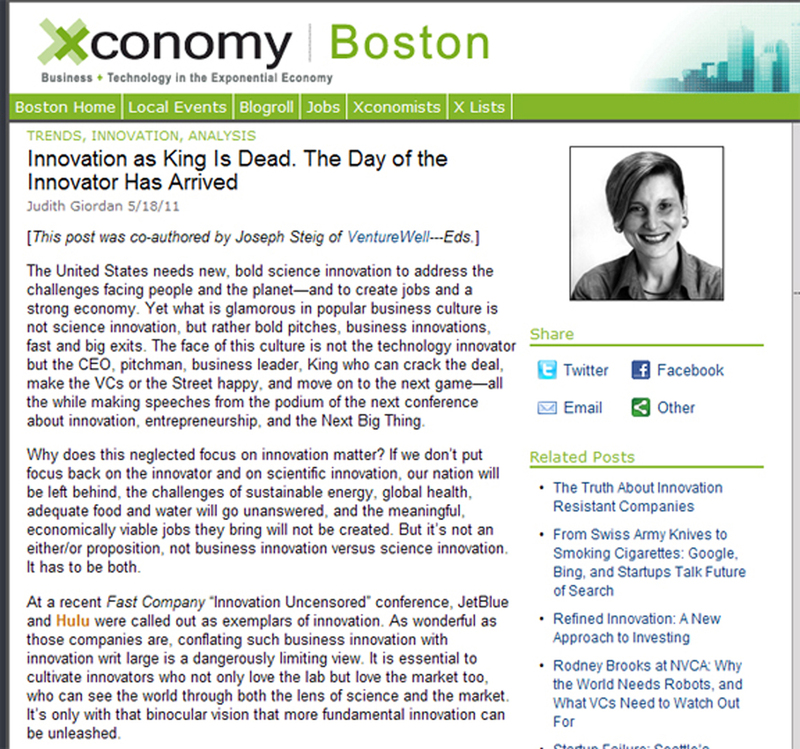 Judy Giordan and Joseph Steig co-authored a May 18, 2011 article on Xconomy. In "Innovation as King Is Dead. The Day of the Innovator Has Arrived" Judy and Joseph address the underlying issues challenging science and engineering innovation in the United States, and how these issues are of vast importance for the economy, the nation and ultimately the entire world. They recommend a path forward for business leaders, scientists and engineers to work together on "...transforming the Valley of Death into what it truly is: a Time of Brilliance..."! Judy and Joseph were featured in an article in Mass High Tech: The Voice of New England Innovation on March 30, 2011. In "Entrepreneurs help the next generation learn from their life lessons" Judy and Joseph explain some of the key issues that scientists moving into industry need to consider. Judy counsels that "You need to understand what markets can you get into what price points and how much will they buy." She also advises that people think about their market strategy - "People think about, 'Look at my exit strategy', and, 'Here's my 30-second pitch.' We've sort of trained people to do pitches and that's unfortunate." Are Women as Competitive as Men??? Judy was featured in an article in the Pittsburgh Examiner on September 24, 2010. In "Are Women as Competitive as Men???" author Tamanna Sultana, PhD, explains how Judy's 2007 NSF funded study, Project Enhance, shows "that confidence is the single best predictor of career success for women." be confident about yourself, know how much you need to do to achieve what you want to achieve and do it." Judy was quoted in C&EN's article "What Researchers Who Want To Be Entrepreneurs Need To Know" with advice to scientists seeking to become innovators. To read the full article, which includes further insights from Judy, click above! Judy Giordan's article "Why it has to be women" was published in the Intellectual Asset Management (IAM) Magazine in the January/February 2010 issue. In the article Judy highlights data on how companies that include women in senior positions tend to do better than those that do not - there are tangible effects. Judy asserts that qualified women do exist for senior management positions, and companies need to acknowledge that this is the case "... this is not a zero-sum game in which every position taken by a woman is one lost by a male, but rather that corporate growth and viability is a tide that raises all boats and creates greater value and opportunity for all."